NephMadness 2014: Are you ready for the Madness? The entry period for NephMadness 2014 has started. Go to the NephMadness Tourneytopia site to submit your picks by Noon EDT on March 26th. It is important to get your bracket picks submitted by this date in order to be included in the madness that will start when we begin to announce the winners beginning at 3PM EDT on March 26th. The leader boards will update on the NephMadness Tourneytopia Current Standings site and the real madness will begin. The fun doesn’t stop there. 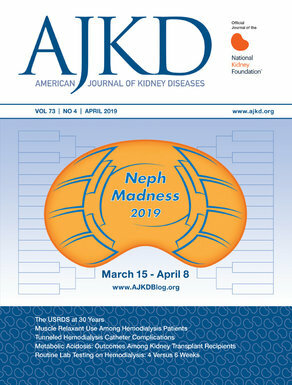 The eAJKD blog team will continue to offer educational material related to NephMadness and you as the reader are invited to participate. NephMadness is all about community. This is the Madness of NephMadness. You can do this by interacting directly on the eAJKD comment section, the NephMadness Tourneytopia comment section, or on twitter by using the #NephMadness hashtag. All of the twitter discussion and #trashtalk related to NephMadness is continuously updated at nephmadness.com.